Terrifying dashcam video in Australia shows the moment a large road sign falls onto a moving vehicle. 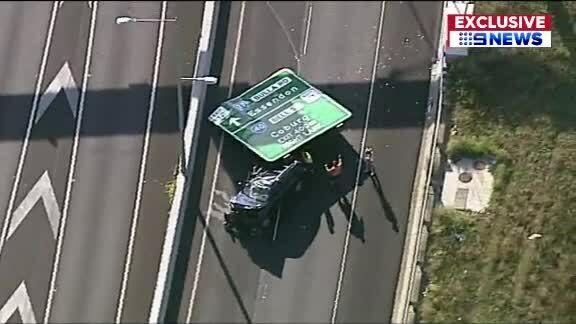 MELBOURNE, Australia (CNN) — Terrifying dashcam video recorded in Australia shows the moment a large, metal road sign fell onto a moving vehicle this week. The incident occurred on Melbourne’s Tullamarine Freeway on Tuesday. The driver of the vehicle, a 53-year-old woman, suffered minor neck injuries and was taken to the Royal Melbourne Hospital in stable condition, Ambulance Victoria told Australian’s Nine Network. RTE reported the sign, 16 feet wide by 13 feet high, was partly welded and bolted to the overhead barrier when it fell during the evening rush hour. The road was closed for inspection but later reopened. RTE reported that authorities have launched an investigation to determine why the sign fell.